Building your own garden tool kit is a great way to ensure that you have all the gardening tools you need at your disposal, whenever you need them. When developing a garden tool kit (which won't actually fit in a toolbox but instead includes tools large and small that are important when gardening) it's important to think about the kinds of gardening you're planning to do and what sorts of tools you might need. Here are some general ideas about the garden tools you might want for specific types of gardening jobs. These are, of course, the very basics of tools that you might need to keep your garden looking nice. And as you get more into your specialized area of gardening, you might find that you want some more specialized tools, such as a tiller, different kinds of shovels and rakes, or more electric or motorized tools. If you've just purchased a new house or are starting gardening for the first time, you're not going to want to go out and buy every tool you might need all at once. This would be really expensive, and you might not have figured out exactly how you want to store your tools yet. Start out by buying just the things you need right away. At the beginning of the growing season, for instance, you'll need a shovel and maybe a spade for planting, as well as a hose or watering system. 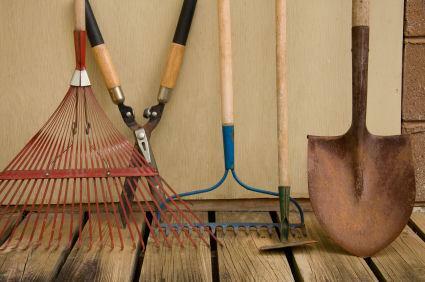 You can probably wait until later in the season to buy tools for weeding, harvesting and raking. When you're buying garden tools, you want to go for products that are good quality. That doesn't mean you have to spend $50 on a shovel, but a tool shouldn't look or feel like it's going to fall apart after a day of hard work, either. If you aren't sure exactly what you need, ask someone at the store for help. Most people who work at home improvement and garden supply stores are knowledgeable and can help you pick out the best tools for the projects you will be working on. The most important part of a successful garden tool kit is proper care and storage of your supplies. Tools should always be cleaned before they are put away. Wipe off any dirt that has accumulated, and at the end of the season wipe down the metal parts of your tools with a rag that has a bit of oil on it. You can also sharpen your cutting tools through the season or at the beginning or end of the season. It's a good idea if you have tools with wooden handles to wipe them down with linseed oil at the end of the season as well. The most important thing is that metal tools not be put away wet and that they aren't allowed to get wet when not in use. Wet tools rust, meaning you'll have to replace them faster. Store your gardening tool kit in a dry place such as your garage or shed and you'll be able to get a lot of use out of your tools for years to come.